Should new energy minister Ed Davey talk to the public about climate change? Britain has a new energy and climate change minister. Ed Davey will have a packed ministerial in-tray, and among the files about nuclear power, shale gas and feed-in tariffs will be the question of how, if at all, the public can be engaged on the need to deal with climate change. Fortunately a new Ipsos Mori poll for Climate Week shows what the public think about climate change, and gives some idea about the communications options open to the new minister. In short, the British public are worried about climate change, are prepared to take action, and believe that their collective action can make a difference. But they think that more time is spent talking about climate change than addressing it and are particularly suspicious of politicians who they hear on the subject. The results of the poll may come as a surprise to some, after the British Social Attitudes survey in December seemed to suggest that Britain was becoming less concerned about climate change. But that survey may have been picking up reactions against left-wing green activists in general, rather than any disagreement that climate change needs to be addressed. 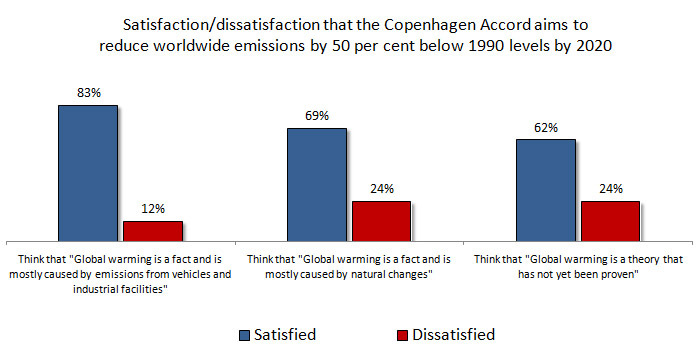 But if the public think that action is needed to address climate change, they don’t believe that enough is being done. Nearly two thirds (64%) agree that “there’s a lot of talk about climate change but not much action”. This present a challenge for the new climate change minister. A response to the fact that the public want action and don’t think enough is being done could be for him to get in the TV cameras and cut the ribbon on a wind turbine factory. But the new poll also suggests that politicians are among the least trusted group to talk about the issue. Just 3% say they would most trust politicians’ views on climate change, putting them at the same level as religious leaders and the royal family. All trail far behind scientists, who are on 66%. With the number of polls I’ve written about here, it’s been a while since I’ve taken stock of the different results and what we can learn from them. Fortunately, MORI have produced (a few months ago) a handy collection of slides, which brings together a lot what we’ve seen into a single place. For regular Climate Sock readers (yep, both of you), most of these points will look pretty familiar – but hopefully still a useful reminder. Climate change and the environment in general isn’t a major issue on most people’s radars. It doesn’t come high in the list when people are thinking about the issues that affects their day-to-day lives. However, it does become more significant when it’s prominent for external reasons: severe weather attributed to climate change; positive media attention (e.g. around the Stern report). Equally, it can be less of a concern for the opposite reasons. Indeed, the dates for the fieldwork for a number of the charts – early 2010 – have, I believe, reduced some of the scores for action on tackling climate change. So comparisons with 2005 and 2008 look worse than I suspect they would have been if the fieldwork had been a couple of months later. 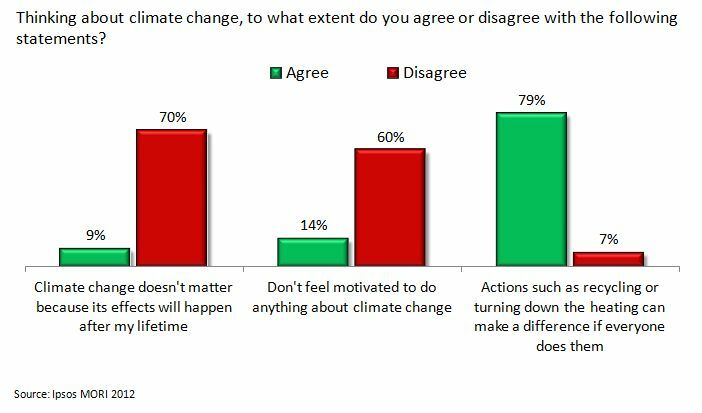 I think this suggests that people generally don’t reject the idea of climate change as an important issue. When they’re reminded about it, it reappears as something important. But most of the time, most people aren’t affected by it at an emotional level, any more than most people in rich countries are affected emotionally by food security in the global South apart from when starvation makes the TV screens. I was at the excellent Blog Nation conference in London this weekend, organised by Liberal Conspiracy. While I think it’s hugely important that tackling climate change shouldn’t be seen as a party political, or a left/right issue, the conference was a good opportunity for leftish bloggers and campaigners to talk about plans for the next few months and years. There are two major issues in public perceptions of climate change in the UK at the moment. The first is to do with understanding and enthusiasm/engagement. While climategate etc has only had a fairly limited impact on perceptions, and while only very few are convinced that man-made climate change isn’t happening, as many as two-thirds are unconvinced that climate change is a big issue. This is a substantial proportion, suggesting a widespread lack of enthusiasm among the public about the issue. The second challenge is to do with who the public are hearing about climate change from. At least in the UK, politicians are the group who are most visible talking about climate change, but they’re also the most distrusted. 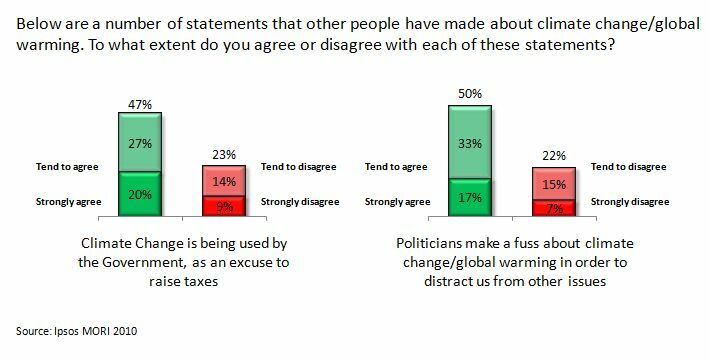 So even where people are generally quite willing to take action, or make lifestyle changes, to deal with climate change, they’re very suspicious when they hear politicians saying that they should do so. There’s an excellent article in a recent New Scientist, which makes a powerful case for rethinking the way climate change is communicated. While the article, by Bob Ward, is controversial, and may jar with a lot of climate scientists and communicators, much of what we’ve seen here in the public opinion data bear him out, and his conclusions seem sound. The article starts with the assertion that climate scientists’ reputation has been damaged by the challenges to the analyses of the IPCC and UEA’s research teams. This is plausible, though I’m reluctant to accept the direct comparison made with the damage suffered by the Roman Catholic Church and the UK Parliament over the last couple of years. It’s true there’s been some decline in conviction in the UK that man-made climate change is happening, but I’m yet to see evidence that this was a direct consequence of the stories about the IPCC and UEA. The polls around the time of the coverage of the UEA email hack suggested little change in public opinion; it wasn’t until the freezing winter that the numbers really moved (though: post hoc ergo propter hoc – this doesn’t prove that the cold weather caused the shift). It may indeed be the case that scientists have become less trusted as communicators about climate change, but as far as I’m aware this hypothesis hasn’t yet been proved. Nevertheless, Ward’s broader argument still stands. 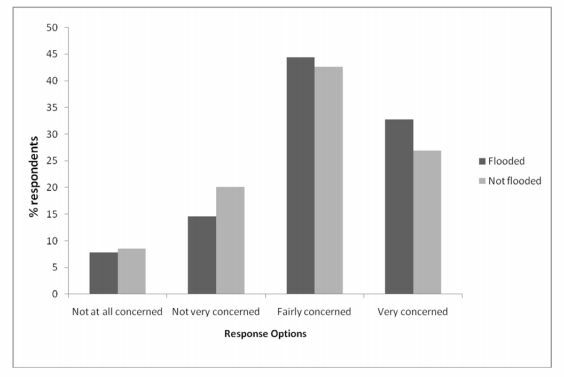 Even if lack of trust in climate scientists is not necessarily itself a major issue, there clearly is a problem. 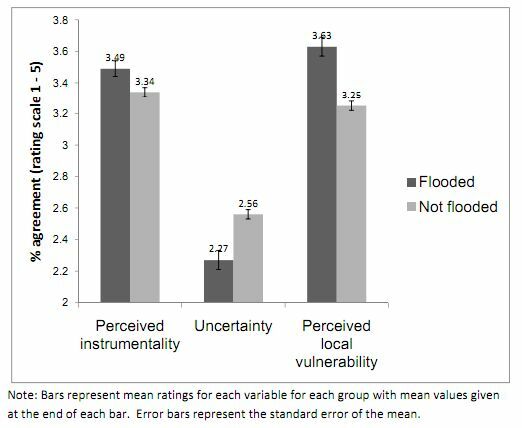 Public interest, belief, and commitment to tackling climate change appear to be fairly malleable, and are affected substantially by short-term factors like the weather – rather than by developments in the science. The activities of critics of climate research are also effectively keeping alive the question of whether or not man-made climate change is happening, to a greater extent than may be justified. On top of this, politicians appear to be the main group who are heard talking about talking climate change, yet they’re also the group who are least trusted to do so.